Books For Men With NO Time to Read! Months ago, I published an article recommending 10 books every father should have on his bookshelf. Today, I am adding to that list! 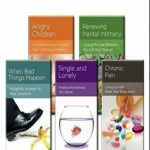 The Christian Counseling and Educational Foundation in cooperation with New Growth Press has published a list of 116 mini-books covering about every type of issue you can face in your home. A partial list is provided below. Each booklet is small, only about 4″ x 7″. Each booklet is very brief, only about 25 pages and immediately practical, powerful, and encouraging. I have referred to many of these mini-books, many times over the past several years. What a blessing to be able to get quick answers without having to read a typical 200 page book! I purchased about 50 of these min-books and placed them in a special box that my wife and children can pick up and read as needed. They have proven to be a tremendous help to all of us. The best deal on these mini-books is found at wtsbooks.com.